There are several techniques which will replace or cover teeth that are lost or so badly damaged they cannot be salvaged by fillings or repairs. Both dental crowns and dental bridges offer a solution to problems which involve badly damaged teeth, but both are used for different purposes. Dental crowns are appliances which are created to fit over an existing tooth. They are often used to cover teeth which are so badly decayed that fillings will simply not solve the problem. They may also be used when fillings would be very unsightly, as in a front tooth. Crowns are also used to cover teeth which are broken off in accidents and cannot be repaired. Dental crowns are made of durable materials such as porcelain and ceramic and often fused with metal for further strength. Crowns offer support for surrounding teeth, and can be fashioned to appear exactly as your other teeth in color, size, and shape. Most people will never know you are wearing a dental crown. Dental crowns offer not only cosmetic benefits but health benefits as well. By preventing shifting due to weakened or missing teeth, crowns support surrounding teeth and keep your smile healthy. 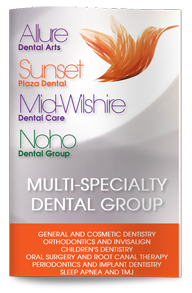 Our dentist in West Hollywood, Dr. Poneh Ghasri, is an experienced dental specialist who has placed countless dental crowns and understands the precise methods which give you the best results. Dental bridges are appliances which fill a gap left by several missing teeth. While some appliances can be attached directly to the jawbone like dental implants, dental bridges usually refer to a free-standing appliance which is attached by anchoring it to surrounding teeth. Most dental bridges are extremely long-lasting because they are constructed of very durable material, such as porcelain and metal. The most important function of dental bridges is to “bridge the gap” between missing teeth to prevent shifting. If missing teeth are not replaced, the resulting gap can cause the remaining teeth to shift out of place, leading to tooth decay, orthodontic problems, and even gum disease. Dental bridges remain a popular choice for those who have the need to replace several teeth at once. Our dentist in West Hollywood, Dr. Poneh Ghasri, is ready to consult with you today about your dental bridge needs and how to address them. Visit our West Hollywood cosmetic dentist, Dr. Ghasri, and discover all the options you have for lost or damaged tooth replacement.